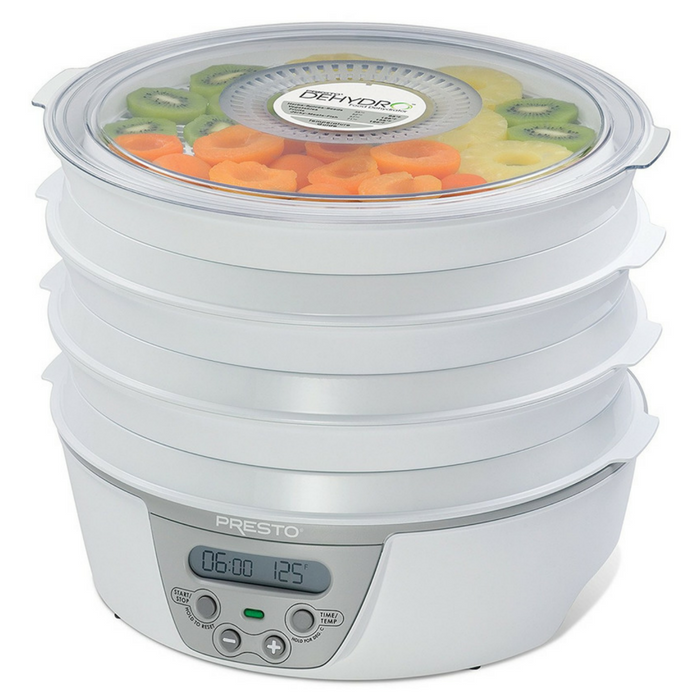 Presto Food Dehydrator Just $55.92! Down From $110! PLUS FREE Shipping! You are here: Home / Great Deals / Amazon Deals / Presto Food Dehydrator Just $55.92! Down From $110! PLUS FREE Shipping! Don’t miss this deal! Amazon is offering this Presto Food Dehydrator for just $55.92 down from $109.99 PLUS FREE shipping! Dehydrate fruits, vegetables, herbs and spices, as well as make great-tasting jerky and fruit rolls. This deluxe digital dehydrator includes six drying trays, expandable to 12 trays for added drying capacity. The drying trays nest when not in use for over a 40% reduction in storage space. Dehydration maintains natural vitamins and minerals–with no additives or preservatives. Make homemade jerky using your choice of meat, poultry, or seafood. Includes starter packs of jerky spice and cure. Also included are two Fruit Roll Sheets for making healthy fruit rolls and strips from fresh, frozen, or canned fruit and two Nonstick Mesh Screens for drying small and sticky foods. The digital timer and thermostat provide precise drying times and temperatures that range from 90 degrees to 165 degrees F.